Showy canna lilies feature large, sometimes colorful leaves and gorgeous lily-like blossoms in red, orange, yellow, white and deep rose. Foliage can be deep green, burgundy, blue-green, or even striped with red-bronze or white. The combination of leaf and flower color can be stunning and unusual. These plants are not true lilies. And they're often described as easy care. Yes, anyone can grow them...but growing them well, so that they're gorgeous and full, takes some work. Without it, this can become a ratty-looking eyesore you'll wish you'd never planted. 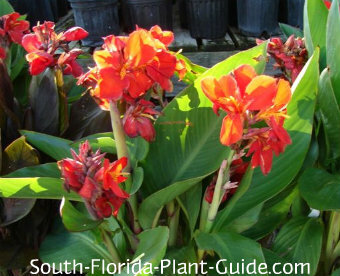 Canna lily care can be too intensive for some people. This is certainly not a plant for the armchair gardener - which explains why it isn't planted more often in home landscapes. 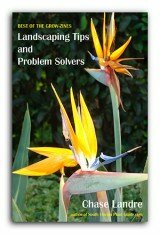 Only an avid devotee of tropical gardening will enjoy providing the regular attention cannas require - water, fertilization, deadheading, and removing browned leaves. They also spread, so thinning out beds every few years may be needed. But the rewards are great if you have the motivation to do the work. The sight of a well-kept bed of these plants makes a magnificent landscape statement. This plant loves water. Some varieties are marginal pond plants that like boggy areas, but most prefer a well-drained location with frequent waterings. Because of its spreading habit, love of water and need for maintenance, this plant is typically planted alone or with few other plants rather than mixed in with a lot of different things. Cannas bloom during warm months of the year. They're available in tall or small varieties. Rhizomes (they look like funky elongated potatoes) or young plants are usually available in spring at your local nursery. Regular varieties reach heights of about 4 to 6 feet - dwarf ones grow 3 to 4 feet tall. These plants do best in full to part sun. They'll grow in partial shade, too, but won't flower as much. Place in an area that isn't subject to strong winds...against a fence, near the house, or sheltered by windbreak plantings. 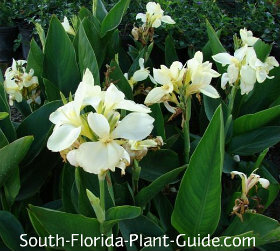 Though they're water loving plants, canna lilies prefer a well-drained area. 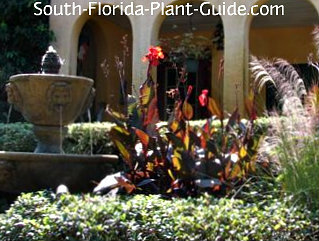 This plant is cold tolerant in South Florida but may die back in cooler areas in winter. Even in Zone 10 they may show some cold damage. If you buy a potted plant, add a mixture of composted cow manure and organic peat moss to the hole before placing the plant. If you're planting rhizomes, prepare the soil of the bed first by removing some dirt and filling with a mixture of composted cow manure and organic peat. Dig the hole 3 or 4 inches deep, place the rhizome in with its "eyes" facing up (eyes are nodules where new growth will sprout). For very tall varieties, you can use tomato cages to help stabilize the plant. Leaves will eventually cover the cage. This is NOT a drought tolerant plant. Regular watering is a must. Let cannas go too dry and they'll let you know just how unhappy they are with you. Trimming back browned leaves near the base of the plant is a fairly frequent chore. In spring, cut back any parts of the plant that have sustained cold damage to make room for fresh, new growth. After a number of years, it's beneficial to thin out a bed of cannas by digging up some of the rhizomes. You can use some in other areas of the garden if you like. This plant is a heavy feeder. Fertilize 3 times a year with a good quality granular fertilizer. Supplement feedings with liquid fertilizer to promote heavier bloom. 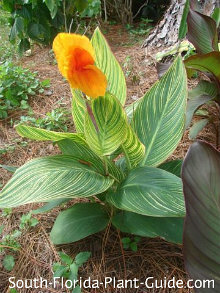 A canna lily's flowers usually grow in several stages from a single stem. To keep the plant in more continuous bloom, deadhead on a regular basis. Once a flower has withered, cut back the stem to just above the next bloom, which will already be starting to open. Once this one wilts, cut the stem again to the next flower. Once all the blossoms on that particular stalk are gone, cut the entire stalk back as close to the ground as you can get. Doing this keeps the plant from going to seed and directs its energy into producing more blossoms. 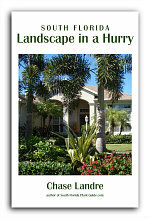 Place plants about 2 to 2-1/2 feet apart. Keep them at least 3 or 4 feet from nearby plants. Rhizomes should go in about 2 or 3 inches deep and a foot or two apart. Come out from the house about 3 feet. Same goes for planting near a walk or drive. These plants will grow for a time in a large container. 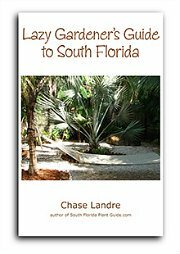 COMPANION PLANT SUGGESTIONS: Nearby plants might include fountain grass, yellow elder, copper plant, thryallis, and bougainvillea.